Huawei MediaPad T1-A21L Charging Ways Charging Jumper Here is the solution for Huawei MediaPad T1-A21L Not Charging problem like there is No Charging indication shows on the display when the battery charger is being a plug-in. 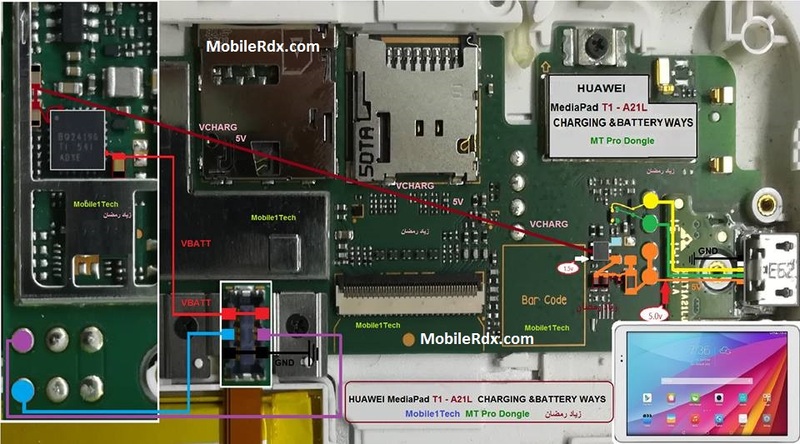 This problem is may cause by a faulty charger or faulty components on Huawei MediaPad T1-A21L PCB board. This problem may sometimes happen if the device suffered wet or water damaged or just exist. Huawei MediaPad T1 8.0 tablet was launched in September 2014. The tablet comes with a 8.00-inch display with a resolution of 800 pixels by 1280 pixels at a PPI of 188 pixels per inch. The Huawei MediaPad T1 8.0 is powered by 1.2GHz quad-core Qualcomm MSM8212 processor and it comes with 1GB of RAM. The tablet packs 8GB of internal storage that can be expanded up to 32GB via a microSD card. As far as the cameras are concerned, the Huawei MediaPad T1 8.0 packs a 5-megapixel primary camera on the rear and a 0.3-megapixel front shooter for selfies. The Huawei MediaPad T1 8.0 runs Android 4.3 and is powered by a 4800mAh non removable battery. It measures 210.60 x 127.70 x 7.90 (height x width x thickness) and weigh 360.00 grams.